On March 18-19th, the Penn-Del-Jersey and Western PA Chapters, NECA held their 3rd Annual State Advocacy Day in Harrisburg, PA. During Monday night’s Joint Board Meeting, the two Chapters learned about NECA’s ongoing government affairs efforts and deliberated on shared issues of concern. On Tuesday, participants met with members of the PA General Assembly to discuss their legislative priorities. Topping it all off, attendees even had the opportunity to meet and chat with Governor Tom Wolf, who visited the group during its luncheon on Tuesday! Monday’s Joint Board Meeting mainly consisted of an overview of the issues facing the industry in the state. 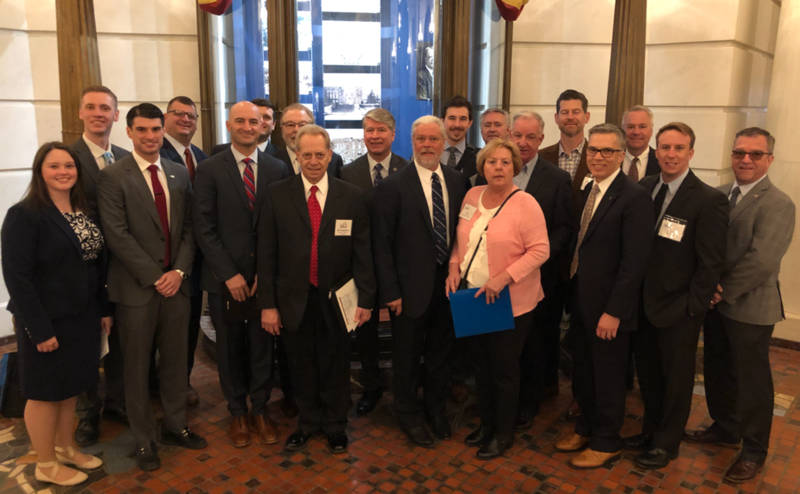 Included was an update on NECA-supported issues in Pennsylvania such as Data Center Equipment Tax Initiatives, Worker Misclassification, and Workforce Development. The Chapters also took this time to familiarize attendees with Rep. Tarah Toohil’s NECA-supported House Bill 304 for the clarification of Sales & Use Tax Language on Traffic Signals. Penn-Del-Jersey Chapter lobbyists Joe Uliana and Mike Oscar both also spoke, mentioning several of the Chapters’ recent legislative victories. Near the end of the meeting, NECA National Government Affairs Manager James Farrell presented on the top federal issues facing the state and the results of the recent general election before briefly discussing NECA National’s Legislative Conference. Following the Joint Board Meeting, the Chapters held an enjoyable reception with state legislators during which attendees were encouraged to chat with the lawmakers about their businesses and governmental concerns. A dinner followed, during which the Chapters heard from several of the attending legislators including Representatives Stephens and Driscoll. These speakers inspired attendees and left them very excited for the following day’s activities. The next morning, the Chapters held advocacy meetings with over two-dozen state legislators. During these meetings, Chapter lobbyists and members advocated for several bills and secured for them several new co-sponsorships. Finally, during Tuesday’s luncheon (the day’s final event), participants had the honor of meeting and chatting with Governor Tom Wolf himself! Discussion with Governor Wolf covered several topics including tax language and apprentice training programs. This was an excellent opportunity for members to share their concerns directly with the state’s chief executive. After the discussion, a group photo was taken with the Governor, the event was formally concluded, and participants headed home. This two-day event was packed full of exciting opportunities for members from both Chapters to collaborate, interact with NECA National, learn and advocate for the Pennsylvania Chapters’ top legislative priorities, and make a real impact. This entry was posted in Uncategorized on March 28, 2019 by Rob Triplett. ‹ Philadelphia “Chamber Day” in Washington, D.C.